Faithful-to-the-prototype detail, in O Gauge (1:43 O Scale running on 32mm track gauge). Sprung coupling hooks, three-link couplings and sprung buffers. DCC and sound ready - NMRA compliant 8-pin DCC socket saddle tank; provision for sound speaker in the under chassis keeper plate. Powerful 12V DC motor with flywheel, driving the locomotive wheels via a precision gearbox. Low gearing for prototypical slow, smooth running. Fine-flange blackened finescale wheels to Gauge O Guild standard. Cab backhead detail and detailed injection moulded body; heavy diecast chassis. Model supplied with a full set of injection moulded loco tools - shovels, rake, pricker etc, plus oil bottles and bucket with separate wire handle - and an etched brass fret of loco works plates (11 different sets), cabside number plates (six sets) and tankside nameplates (ten variations). This shop is directly linked to my retail premises in Eastleigh High Street. 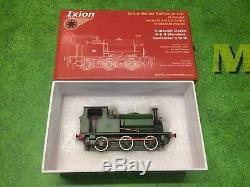 The item "Ixion, O Gauge, Hudswell Clarke 0-6-0 Contractor's tank Loco (Green)" is in sale since Tuesday, July 10, 2018. 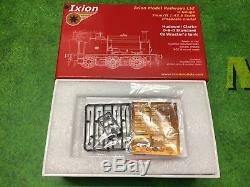 This item is in the category "Collectables\Model Railways & Trains\O Gauge\Locomotives". The seller is "acmodels2" and is located in Eastleigh. This item can be shipped to United Kingdom, Antigua and barbuda, Austria, Belgium, Bulgaria, Croatia, Cyprus, Czech republic, Denmark, Estonia, Finland, France, Germany, Greece, Hungary, Ireland, Italy, Latvia, Lithuania, Luxembourg, Malta, Netherlands, Poland, Portugal, Romania, Slovakia, Slovenia, Spain, Sweden, Australia, United States, Canada, Brazil, Japan, New Zealand, China, Israel, Hong Kong, Norway, Indonesia, Malaysia, Mexico, Singapore, South Korea, Switzerland, Taiwan, Thailand, Bangladesh, Belize, Bermuda, Bolivia, Barbados, Brunei darussalam, Cayman islands, Dominica, Ecuador, Egypt, Guernsey, Gibraltar, Guadeloupe, Grenada, French guiana, Iceland, Jersey, Jordan, Cambodia, Saint kitts and nevis, Saint lucia, Liechtenstein, Sri lanka, Macao, Monaco, Maldives, Montserrat, Martinique, Nicaragua, Oman, Pakistan, Peru, Paraguay, Reunion, Turks and caicos islands, Aruba, Saudi arabia, South africa, United arab emirates, Ukraine, Chile.